I had an epiphany today. We’re leaving. We’re leaving. We’re leaving. I officially posted it on Facebook recently after weeks and months of disbelief. I mean, I knew it was coming. It was always part of the gig. My husband and I signed up for a temporary rotation. We applied and we were accepted into the program. 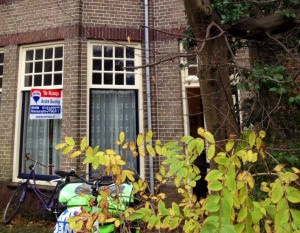 I think this simple fact – that we moved to the Netherlands voluntarily – had a huge impact on our attitude towards the engagement (and our stubborn determination to MAKE IT WORK) when at times, defeat seemed imminent. Normally, the rotation lasts 18 months. Like America’s maternity leave policy of 12 weeks, I think this is strategic. 18 months is short enough to get your feet wet, but not dive head-first and swim to the surface and order a Mai Tai at the swim-up bar. At this shorter time frame, you’re still figuring things out and have your life raft of going back home when things get rocky. Because of our January 2012 start date, we started out at a 2-year rotation (to get in two autumn ‘busy seasons’ for V). We had a groove by the end of 2013. We were happy, and with the kids growing older, we really wanted to stay longer. We extended to October 2014. After finding out we were pregnant, with a due date of early October, everyone agreed to extend an additional 3 months, with a departure date of January 31, 2015. The kids and I arrived at Schiphol on January 21, 2012. Three years and 10 days later, our time in the Netherlands will end. Three years and 10 days. It seems like a small amount of time, but in reality - it’s more than half of Cosette’s life, the majority of Holden’s life, and all of Brecht’s life. That’s significant. An expat friend asked me recently “When did the Netherlands feel like home?” In our cultural training, they had told us to expect a 6-month transition. It took us longer. After arriving in January, I was anxious for spring to arrive. I waited and waited and waited for it to get warm. June 2012 and it was still too cold for my Texas blood and I stared out the window. There were 1,000 other factors that led me to this conclusion, but the cloudy and grey skies were the final straw. “I don’t know if we’re going to make it,” I said out loud to no one. V went on a business trip and my doubts grew more intense. I remember V asking me if I wanted him to call Dallas to send us back home. I didn’t want to give up. But moving to the Netherlands was the hardest thing I’d ever done. We’d been emotionally stretched in ways we didn’t know we could move – individually and as a family. I told V no. Don’t call Dallas. We’re going to keep trying. Moving overseas was our dream. The sun came out and the thermometer rose. The skies resembled something I had seen before. We picked up our pace, smiled. We went outside without our jackets on. In October my best friend visited from the States. Having her familiar face in my foreign world lifted my spirits immensely. Then we went home to visit. We hosted a party and saw everyone we loved in Texas. We had friends from Dallas, Ft. Worth, and Waco attend. We headed to Baton Rouge and we were embraced with more hugs, smiles, and cheered on the LSU Tigers. I stocked up on Bath & Body Works lotions, fajita marinade, and washable markers. There was a shift in my mind. When we landed in Amsterdam, I was ready. I knew we could do it. I knew this was home. For the past few years we’ve been through the spectrum of life experiences – weddings, funerals, starting jobs, ending jobs, making new friends, and losing others. We’ve celebrated 1st, 2nd, 3rd, and 4th birthdays here. I’ve joined bookclubs, a writing group, run a B&B, hosted Thanksgiving and Christmas Eve dinners, sent my daughter to kindergarten, and then sent her to a better one. Our children have been to 13 countries. They can identify the Eiffel Tower, Big Ben and Van Gogh paintings. They speak and understand Dutch. We’ve been on international T.V., I gave birth to our third child, and we have thousands of more memories and experiences. This is home. We’re leaving. We’re leaving. We’re leaving. How do I feel about this? In reality, I’m heartbroken. Home is where the heart is and I feel that forever, my heart, or at least a small piece, will be left in this country. People often ask – could you stay? Is the option there? I guess it is – V could get a permanent job here. I believe he could. There are a lot of financial implications that would have to shake down and I’m not sure if he’d like to work for the Tasmanian Devil forever, but would that be something we’d want? There are days where I say yes! (Mostly when it’s sunny). But there are a lot of things pushing and pulling us back. For every life event we’ve had in the Netherlands, there’s also a birthday, engagement, chemo treatment, hospital stay, and Christmas Day we’ve missed in Texas, too. As much as I adore my daughter’s new Dutch school, they aren’t going to teach her the Pledge of Allegiance, either. What’s next for us? To be honest, we’d hoped for another adventure. We’d looked into moving somewhere else – London, Austin, Chicago – but nothing panned out. So we’re headed back to where we started – Dallas. And back into our old home at that. Will we embrace the familiarity? Or will we feel like it’s the equivalent of going to college and then moving back in with your parents? I’m not sure. I worry that our entire Netherlands experience will feel like a dream, but then again, I’ll have a 4-month old baby at 4:00 a.m. to wake me up from it. If anything, I know it took us a while – ten months - to find the balance between our American heritage and our Dutch surroundings, and we found home here in Leiden. With a little patience, trial and error, and ingenuity, I think we’ll find a new normal back in Dallas – meshing our European lifestyle with American culture. It won’t be the same as when we left - just as everyone else has changed in the past three years. We’ll find a new dream, and go after it with as much passion as we’ve exerted over the past few years. In the meantime, I’m going to have a kick out of introducing my children to the Texas and Louisiana cultures they’ve missed. After all, New Orleans Café’ Du Monde beignets have a strong resemblance to Dutch Oliebollen.